The ‘Economic Dimension’ encompasses the power that consumers, private companies and governments exercise over each other as they interact to create wealth and obtain goods and services – bargaining and making financial transactions. The ‘Moral Dimension’ describes ways in which people influence each other’s behaviour by encouragement and persuasion; it includes religious and non-religious rules and expectations. The ‘Legal Dimension’ consists of the formally explicit rules which are applied by a group to its members, using coercion if necessary, to enforce some aspects of behaviour for which persuasion alone is perceived as being insufficient. The ‘Political Dimension’ describes the arrangements by which decision-makers – politicians – are appointed to act on behalf of the people, their mechanisms for determining what is needed, and what influences their decisions. Politicians have decision-making powers in other dimensions of governance, but they have to take account of public opinion. It is argued here that these four dimensions, whilst they are inter-connected, differ fundamentally in how power is exercised and in the nature of their authority. Both Economic and Moral power can be exercised by one person directly upon another, irrespective of any formal authorisation, but Economic power is inherently financial. Legal power requires formal authority, is tightly defined and is relatively stable in nature. Political power, although it has a structure of authority, works through numerous channels and is inherently dependent upon the agreement of its subjects; it is constantly affected by changing circumstances. freedom of expression and limits on political interference. a voice in how one is governed. ‘Ungoverned Power’ is the term used in this book to describe the reliance upon an ad hoc balance of power as a substitute for, or as supplementary to, established forms of governance. This fifth dimension can be seen either as a burden, a vulnerability to threats and a need to protect oneself, or it can be perceived as a freedom from the constraints of formal governance. 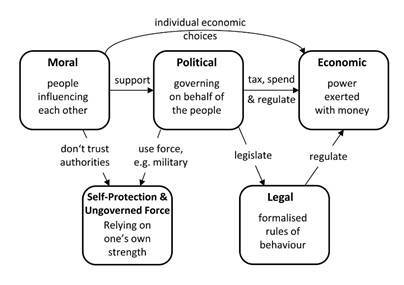 People influence each other’s moral values, which determine the degree to which they support the politicians; the political system provides the framework within which the rules of legal and economic governance are negotiated; politicians set levels of government spending and taxation; and they decide when to use ungoverned force, such as the military. People are free to conduct their lives, including making economic decisions, within the framework of law and regulation; they might also choose to protect themselves if they cannot trust the authorities. Each of the next five chapters explores one dimension in turn – highlighting the differences and connections between them.